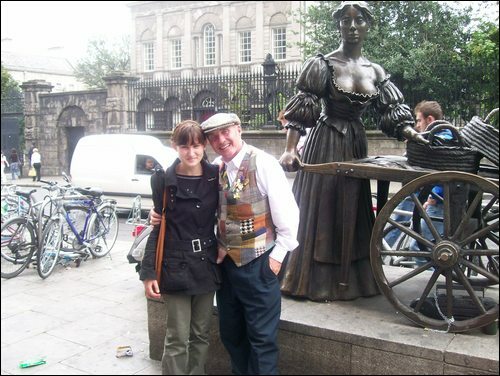 This entry was posted in Columns, Features and tagged Dublin city centre, Humour, Ireland, Ireland's economic downturn, leprechaun, Life, postaweek2011, Recession, Society by Kate Katharina. Bookmark the permalink. Anyone who finds this post facetious should emigrate. I remember when I first saw the big headed leprachaun. I was back in Dublin (after emigrating) and my first thought was ‘awww jesus…’ my second thought was ‘awww genius’. Hehe, I passed by at the weekend and there are now TWO giant leprechauns. The tension… Do people recognise leprechauns in Korea? Awh yeah, man I’d forgotten about that bodhran guy. Man, that really makes me dislike the leprechaun guy even more. If no-one was there beforehand, he was completely legit to be there, and similarly legit to not be gentle to stop people trying to steal his spot (which is exactly what did happen). I thought you’d like this by the way. (and funny you mention what goes around…. ), after reading this piece, and reflecting on how the guy had his spot stolen, I thought what if someone ELSE in a leprechaun costume came along and started busking right beside the other guy? And lo and behold, what did I see on saturday morning on the way to work? 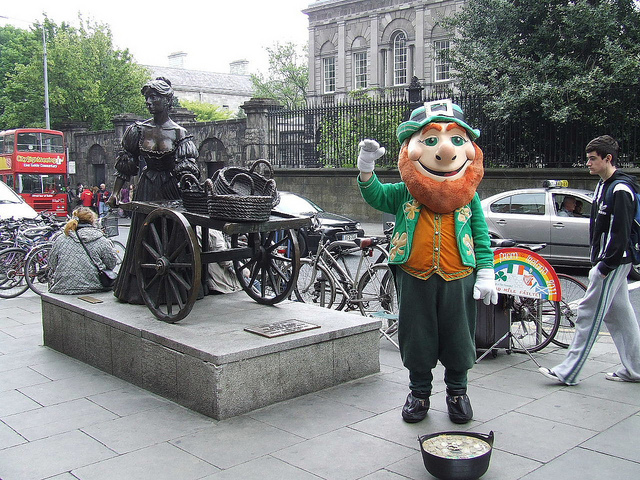 Two giant leprechauns by the statue. hehe, I saw that too! And funnily, one of them is about one giant leprechaun head taller than the other! When I passed they were posing together for a photograph.. maybe they’re besties, or brothers..!